SNOHOMISH COUNTY, Wa. 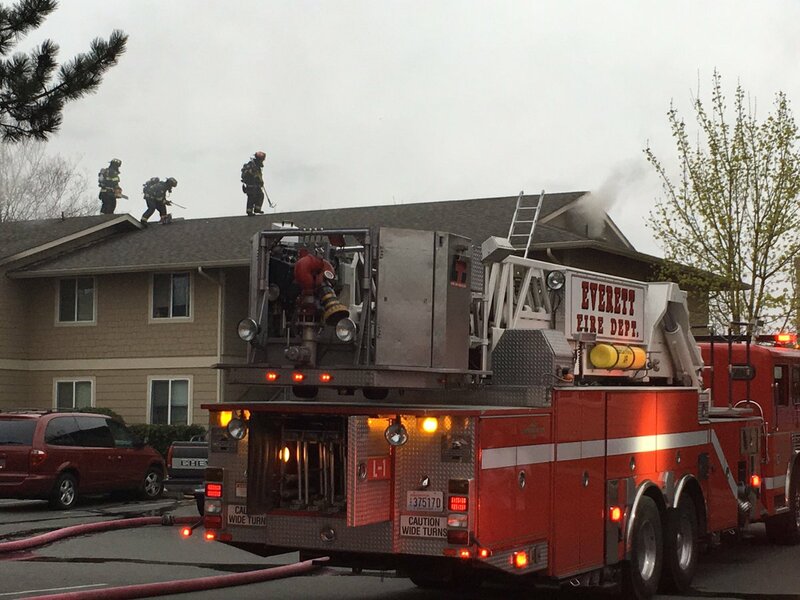 | Firefighters from Snohomish County Fire District #7 were dispatched just after 1900 hours PDT, to an apartment fire located in the 14600 block of 179th Ave SE in Monroe. The Fire Investigator is on-scene and has determined the fire started in the kitchen. The cause has not been determined at this time, but the FIU Investigator is currently investigating. Resources on-scene were from Lake Stevens FD, Everett FD, Woodinville FD, Duvall Fire District #45 and Snohomish FD. Monroe PD assisted with traffic control duties and the transported the injured kitty to a local vet after Firefighters brought it back to life. A total of 19 residents have been displaced by the impacted by the fire. The American Red Cross is currently assisting the families. Quickly egressing upon the fire, firefighters were able to put the fire out within a short amount of time. After the fire was tapped, they immediately checked for any hot spots or extensions. The fire broke out in the evening on Tuesday, April 2, 2019. After conducting primary and secondary searches of the apartment unit, they found no humans home but their four-legged family member was found. Firefighters extricated the unresponsive feline and began giving it oxygen and ultimately saving its life. No one was inside the apartment at the time of the fire. 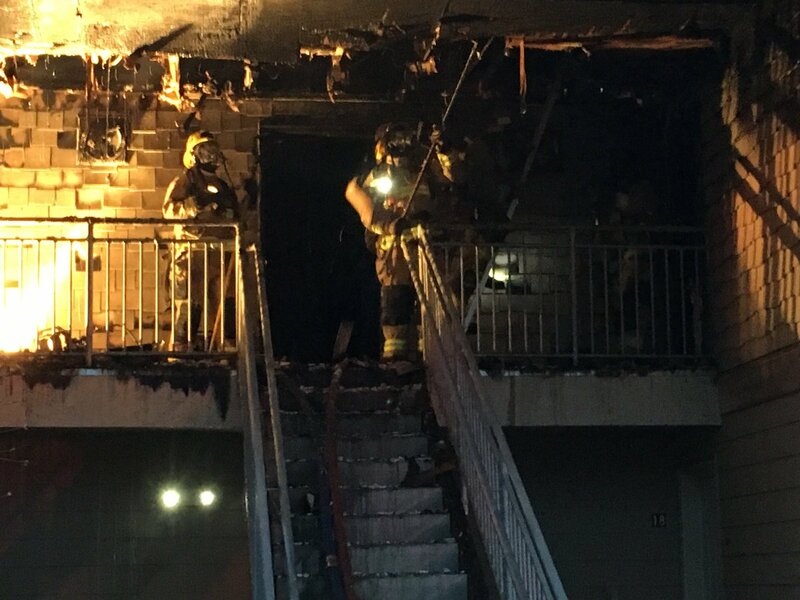 All-in-all, there were a total of eight apartment units affected by the fire. Resources on-scene and assisting with firefighting and containment efforts are from the Lake Stevens FD, Everett FD, Woodinville FD, Duvall Fire District #45 and Snohomish FD. Monroe PD was also on-scene for traffic control and one of their Officers transported the injured kitty to a local vet in the area. 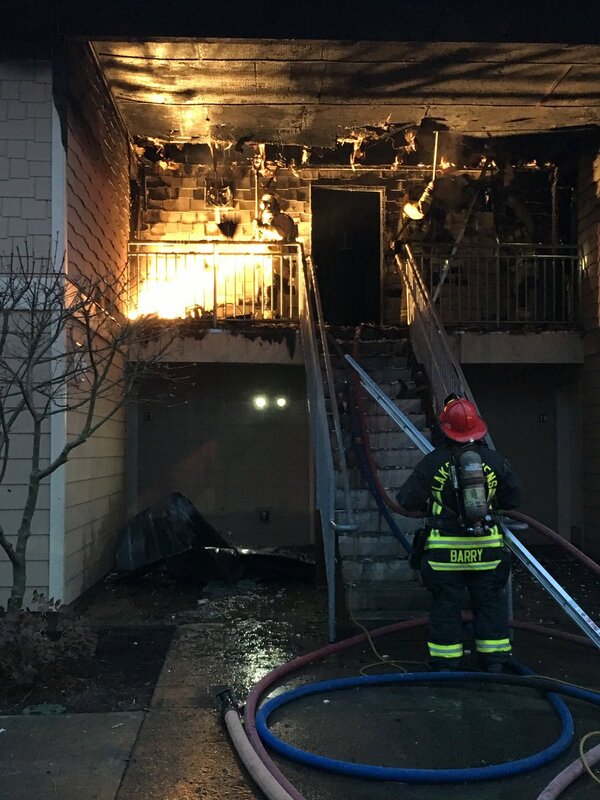 It was a well-coordinated effort by all whom responded to this apartment fire. 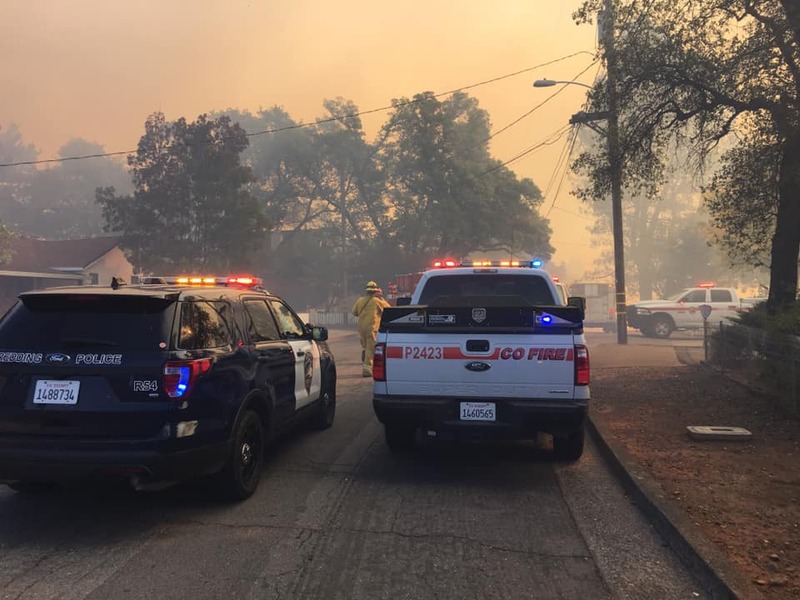 REDDING, Calif. – The Redding Police Department has issued MANDATORY EVACUATIONS due to a fast-moving wildfire that is threatening multiple housing communities. The wildfire has been reported to have started from an unknown cause on Sunday, October 14th at 1100 hours PDT. 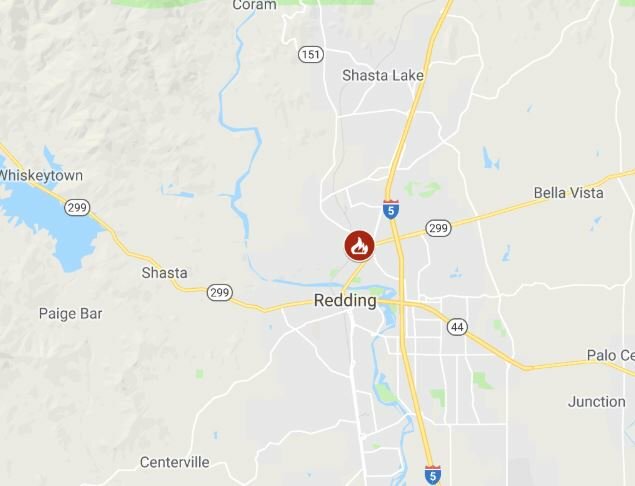 The wildfire named the MASONIC FIRE is located off of Lake Boulevard and Masonic Avenue in Redding (Shasta County), California. The wildfire is north of the Sundial Bridge in the Sulphur Creek area. This FIRE is in the same vicinity where the CARR FIRE was put out. Social Media (Fire) various accounts are reporting the MASONIC FIRE is now being fueled by 45-mph winds that has destroyed one home. An electrical substation is being threatened and crews are trying to save it. 1158 | Per IC, forward progression slowed. Spotting. Now up to 30 acres. 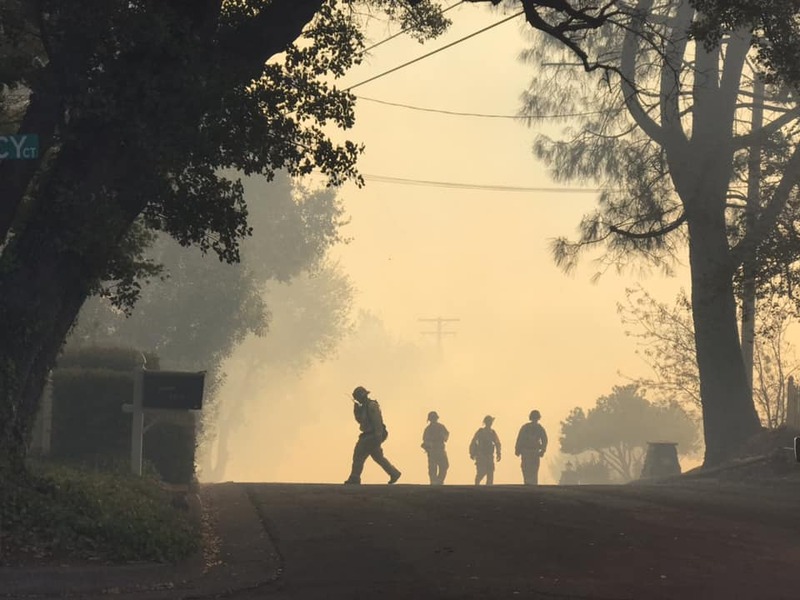 A wildfire named the SNELL FIRE is burning in the Sonoma-Lake Unit (CAL FIRE) service area or about 12 miles southeast of Middletown (Napa County), California. The cause is unknown and under investigation. Fire fuels consist of grassy oak woodlands. There are 1,241 fire personnel assigned to this incident along with 31 crews, 132 engines, 20 dozers, 20 water tenders and 7 helicopters. Fire behavior has been observed as active with uphill runs, single tree torching and flanking. Firefighters are beginning to make great progress. A cooling trend is expected and to assist crews with fire suppression. The fire has burned 2,490 acres and there is a 45% containment status. At this time, many structures including homes are being threatened. Evacuation orders were in effect but have since been lifted. Firefighting suppression and containment costs have soared to $3.9 Million to date. Thank you for reading our blog! You can also catch us at @nwfireblog on Facebook and on Twitter. To make it more simple (yes, we are changin’ up things again), we have combined current and past fire incidents that have occurred today and those that are still actively burning. JENNIE’S PEAK 1039 RN FIRE. 14 miles S of Fossil. Transferred from IMT 2 Command back to the local unit. Min fire behavior. — 45,956 acres. 95% contained. — $2.1 Million cost-to-date. WATSON CREEK FIRE. 13 miles W of Paisley. Moderate fire behavior with group torching, wind-driven runs and short-range spotting. Numerous structures threatened. Closures in effect. — 56,185 acres. 50% contained. — 1,043 personnel. 28 crews. 76 engines. 5 helicopters. — $10.2 Million cost-to-date. TAYLOR CREEK FIRE. 10 miles W of Grants Pass. Min fire behavior. — 52,838 acres. 95% contained. — 390 personnel. 8 crews. 22 engines. — $29.9 Million cost-to-date. Ramsey Canyon Fire. | Credit: NWS IMET Operations. RAMSEY CREEK FIRE. Medford Unit. 12 miles N of Eagle Point. Moderate fire behavior with backing, single-tree torching and spotting. Home and structures threatened. Road closures in effect. Evacuation orders have been lifted. — 1,971 acres. 40% contained. — 942 personnel. 27 crews. 51 engines. 3 helicopters. — 1 structure lost. — $4.4 Million cost-to-date. STUBBLEFIELD 1008 RN FIRE. 7 miles W of Condon. Minimal fire. — 54,221 acres. 95% contained. — 20 personnel. — 1 crew. 2 engines. — 2 structures lost. — $2.2 Million cost-to-date. — Started on private land. KLONDIKE FIRE. 9 miles NW of Selma. Active fire behavior with uphill runs, single tree torching and flanking. Structures threatened. Closures in effect. — 89,597 acres. 37% contained. — 1,046 acres. 20 crews. 47 engines. 3 helos. $29.3 Million cost-to-date. NATCHEZ FIRE. 14 miles SE of Cave Junction. Moderate fire behavior with backing, torching and flanking. Structures threatened. Closures in effect. — 24,605 acres. 70% contained. — 504 personnel. 11 crews. 16 engines. 6 helicopters. — $32 Million cost-to-date. LONEROCK 1057 RN FIRE. 8 miles SE of Condon. Min fire behavior. — 5,056 acres. 95% contained. — 0 personnel. — $560,000 cost-to-date. COLUMBUS FIRE. 5 miles E of Tiller. Active fire behavior with backing, creeping and isolated torching. Closures in effect. — 10,226 acres. 56% contained. — Total 317 personnel. 3 crews. 13 engines. 2 bulldozers. MILES FIRE. 5 miles NE of Trail. Active fire behavior with isolated torching, backing and creeping. Structures threatened. Closures in effect. — 35,741 acres. 54% contained. 317 personnel. 3 crews. 13 engines. 2 helicopters. 2 structures lost. $77.4 Million cost-to-date. SNOW SHOE FIRE. Approximately, 7 miles NE of Trail. 3,816 acres. 100% contained. Part of the 2018 South Umpqua Complex Fire. — Total 317 personnel. 3 crews. 13 engines. 2 bulldozers. ROUND TOP FIRE. 154 acres. 7 miles NE of Trail. 154 acres. 100% contained. Part of the 2018 South Umpqua Complex Fire. — Total 317 personnel. 3 crews. 13 engines. 2 bulldozers. TERWILLINGER FIRE. 5 miles SE of Blue River. Active fire behavior with flanking, spotting and group torching. Structures threatened. Closures in effect. Rain fell over the area on Sunday. — 5,398 acres. 2% contained. — 382 personnel. 9 crews. 16 engines. 4 helicopters. — $2.1 Million cost-to-date. HORNS MOUNTAIN FIRE. 19 miles N of Evans. Transferred from IMT2 back to the local unit on Tuesday, August 28, 2018. Moderate fire behavior with backing, isolated torching and smoldering. Rain fell over the area on Sunday. — 5,439 acres. 85% contained. — 516 personnel. 13 crews. 10 engines. 3 helicopters. — $9.6 Million cost-to-date. CORBETT FIRE. Corbett Creek Road. Stevens County. Crown, grass and brush. PC277 IC at 1630 hours. Dispatched resources at 1556 hours. Controlled/contained at 1615 hours. 0.01 acre. Unknown cause. BOYDS FIRE. 3 miles W of Kettle Falls. Transfer of IMT2 command back to local unit to occur on August 29, 2018. Min fire behavior. — 4,549 acres. 81% contained. — 502 personnel. 12 crews. 30 engines. 4 helicopter. — 9 structures lost — $11 Million cost-to-date. CRESCENT MOUNTAIN FIRE. 18 miles W of Winthrop. Minimal fire behavior. Structures threatened. Closures in effect. Rain fell over area on Sunday. — 42,784 acres. 24% contained. — 559 personnel. 10 crews. 29 engines. 7 helicopters. — $15.9 Million cost-to-date. MCLEOD FIRE. 8 miles N of Mazama. Min fire behavior. Structures threatened. Closures. Rain fell over area on Sunday. — 21,585 acres. 5% contained. — 391 personnel. 9 crews. 35 engines. — $3.8 Million cost-to-date. HOLMAN FIRE. 19 miles NW of Mazama. Min fire behavior. Structures threatened. Closures in effect. — 284 acres. 1% contained. — 0 resources — $4,000 cost-to-date. COUGAR CREEK FIRE. 12 miles NW of Ardenvoir. Min fire behavior. Structures threatened. Closures in effect. Rain fell over area yesterday. — 41,324 acres. 45% contained. — 762 personnel. 18 crews. 27 engines. 9 helicopters. — $30 Million cost-to-date. BANNOCK LAKES FIRE. 14 miles SW of Stehekin. Min fire behavior. Closures in effect. Rain fell over the area on Sunday. — 485 acres. 0% contained. — 0 resources. — $39k cost-to-date. MIRIAM FIRE. 15 miles E of Packwood. Min fire behavior. — 4,228 acres. 40% contained. — 281 personnel. 5 crews. 3 engines. 4 helos. — $11.5 Million cost-to-date. MAPLE FIRE. 2,600 acres. 45% contained. Rain fell over the area last night. Here is a combined report on Northwest wildfires in the Washington and Oregon states. Ramsey Canyon Fire. Medford Unit. 12 miles north of Eagle Point. Timber, chaparral and short grass. Active fire behavior with backing, isolated torching and spotting. Structures and infrastructure under current threat. Evacuations and road closures in effect. — 1,861 acres. 25% contained. 1,072 personnel. 30 crews. 66 engines. 8 helicopter. 1 structure lost. — $3.6 Million Cost-to-date. Taylor Creek Fire. 10 miles West of Grants Pass. IMT also managing the Klondike Fire. Timber and brush are fire fuels. Minimal fire behavior. Structures threatened. Closures in effect. — 52,826 ares. 95% contained. 403 personnel. 9 crews. 22 engines. — $29.8 Million Cost-to-date. Watson Creek Fire. 13 miles west of Paisley. Timber and brush are fire fuels. 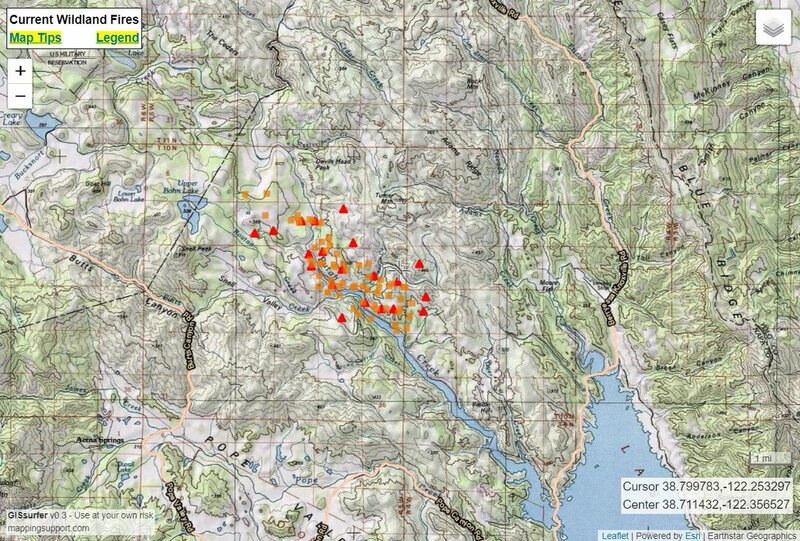 Active fire behavior with single-tree torching, short crown runs and long-range spotting. Structures threatened. Evacuation orders have been lifted. Closures in effect. — 50,144 acres. 40% contained. 1040 personnel. 27 crews. 75 engines. 5 helos. — $8.7 Million Cost-to-date. Caton Fire. 7 miles Southwest of the Village of Yellowpine near Indian Point. Started August 26, 2018 at 1547 hours. Fire was detected on August 24 around 1200 hours. Lightning caused. 400 acres. Initial attack completed by smokejumpers, helirappellers and ground crews, aided by a SEATs and Air Tankers. Due to hot, dry and windy conditions on August 24 and 25th, the fire grew. Natchez Fire. 15 miles southeast of Cave Junction, OR. Timber and Chaparral. Moderate fire behavior with backing, torching and flanking. Numerous structures threatened. Closures in effect. Evacuation orders lifted. — 24,224 acres. 70% contained. — 491 personnel. 11 crews. 17 engines. 6 helicopters. — $31.3 Million Cost-to-date. Klondike Fire. 9 miles Northwest of Selma. Timber and chaparral are fire fuels. Active fire behavior with uphill runs, single tree torching and spotting. Homes threatened. Closures in effect. — 108,530 acres. 41% contained. — 1,240 personnel. 24 crews. 42 engines. 3 helos. — $28.1 Million Cost-to-date. Terwillinger Fire. 5 miles southeast of Blue River. Timber is fire fuel. Active behavior with running, spotting and group torching. Structures being directly threatened. — 4,721 acres. 1 % contained. — 321 personnel. 7 crews. 13 engines. 4 helicopters. — $1.5 Million Cost-to-date. Horns Mountain Fire. 19 miles north of Evans. Transfer of command from an IMT 2 back to the local unit to happen on August 28. Timber and heavy logging slash are fire fuels. Moderate fire behavior with backing, isolated torching and smoldering are being reported. Homes threatened. Closures in effect. — 5,439 acres. 85% contained. — 540 personnel. 13 crews. 10 engines. 3 helos. — $7.1 Million Cost-to-date. Boyds Fire. 3 miles West of Kettle Falls. Timber and brush are fire fuels. Moderate fire behavior with baking, isolated torching and flanking. Structures are threatened. — 4,549 acres. 73% contained. — 529 personnel. 13 crews. 30 engines. 4 helicopters. — 9 structures lost. — $10.5 Million Cost-to-date. Crescent Mountain Fire. 18 miles west of Winthrop. IMT also managing McLeod and Holman incidents. We are reporting them separately from this one. Moderate fire behavior with running, flanking and backing. Homes threatened. Trail closures in effect. Some rain fell over the area on Saturday. — 42,784 acres. 24% contained. — 584 personnel. 11 crews. 33 engines. 6 helicopters. — $15.1 Million Cost-to-date. McLeod Fire. 8 miles north of Mazama. Timber as fire fuel. Moderate fire behavior with isolated torching, flanking and backing. Numerous homes threatened. Closures in effect. Rain fell over the fire line yesterday. — 21,585 ares. 5 % contained. — 497 personnel. 14 crews. 36 engines. — $3.4 Million Cost-to-date. Holman Fire. 19 miles northwest of Mazama. Timber as fire fuel. Moderate fire behavior with flanking, backing and creeping. Structures and communications infrastructure are being threatened. Closures in effect. — 284 acres. 0% contained. — 0 resources. — $3,000 Cost-to-date. Miriam Fire. 15 miles East of Packwood. IMT 2 transferring command to the local unit on Monday, August 27, 2018. — 4,228 acres. 40% contained. 281 personnel. 5 crews. 8 engines. 4 helicopters. — $11.2 Million Cost-to-date. Cougar Creek Fire. 12 miles northwest of Ardenvoir. IMT also managing the Bannock Lakes Fire. Timber is fire fuel, along with medium logging slash and closed timber litter. Moderate fire behavior with flanking, backing and isolated torching. Homes threatened. Closures in effect. — 41,324 acres. 45% contained. — 818 personnel. 19 crews. 28 engines. 9 helicopters. — $28.8 Million Cost-to-date. Bannock Lakes Fire. 14 miles southwest of Stehekin. Timber and brush are fuels. Minimal fire behavior. Trails are the only closures in the area. — 485 acres. 0 % contained. — 0 resources. — $39,000 cost-to-date. Maple Fire. 23 miles north of Shelton and 5 miles west of Hwy 101 on the Olympic Peninsula. Started August 4, 2018 at 1100 hours PDT. Human caused and under investigation. Heavy timber (litter, grass and understory) as fire fuels. Fire behavior is moderate, flanking, backing and creeping. A wildfire that started on Thursday, April 23, 2018 around 1245 hours PDT is located 12 miles north of Eagle Point on land managed / owned by the OR State Department of Forestry where the Medford unit is in Unified Command with the OR State Fire Marshal Office’s Green Team. Heavy smoke previously hampered air operations has lifted enabling four helicopters with bucket drops and three air tankers assisting with reinforcement of containment lines with retardant drops. Fire control lines in the northern, eastern and southern areas were holding well and mop up ops had begun on some parts of the fire. About 1,861 acres of timber and chaparral & short grass have been destroyed. There is a 17% containment status. There are 315 structures that are currently being threatened along with private, BLM and Industrial lands. Level 3 [Get Out NOW] beginning at the address of 17935, and continuing east including addresses 18505, 18509 (all accessed off of West Fork Evans Creek Rd. ), then continuing to include the address of 19373 at the intersection of Meadows Rd; West Fork Evans Creek Rd., the addresses 18504 and 18508; Ramsey Rd., beginning at the address 13469 and proceeding north to include 13001 and 14738 (accessed off of BLM 35-2-20) and continuing to the Meadows Rd. intersection; Meadows Rd, proceeding south from East Evans to include the address of 16880. Level 2 [Get Set] East Evans Creek Rd., beginning at the address 15513 and ending at 16995, and beginning at the address of 19395 and continuing to include the address of 21043 East Evans Creek Rd. ; Meadows Rd, beginning at the address 16800 and 16821, then proceeding south to include the address 14765; Ramsey Rd., beginning at the address 13465 and proceeding south to include the address of 11655. Shelter is located at Hanby Middle School at 806 6th Avenue, Gold Hill, Oregon. Phone # 1-888-680-1455. Resources include 795 total personnel, 45 engines, 12 water tenders, 8+ helicopters, 26 hand crews, 9 bulldozers and air tankers as needed. 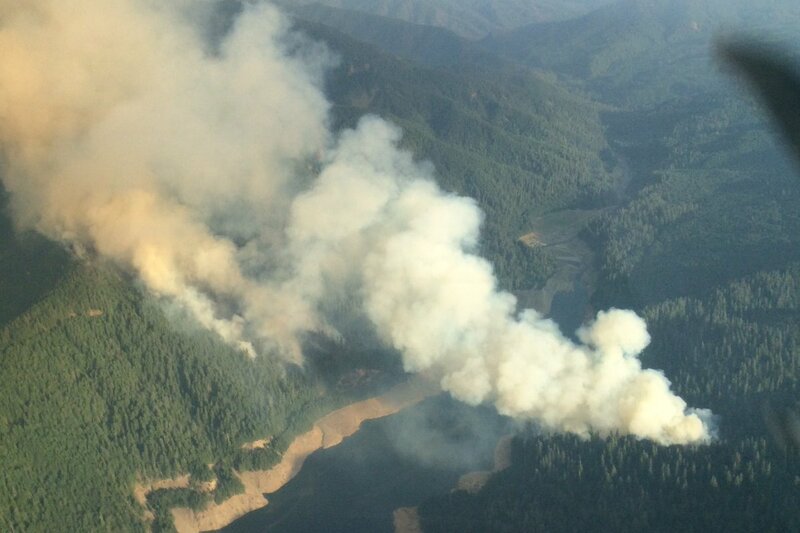 Incident Cooperators include Oregon Department of Forestry, BLM Oregon & Washington, Rogue Valley Fire Chiefs Association, Jackson County Sheriff’s Office – Oregon, Jackson County Emergency Management, American Red Cross, U.S. Forest Service – Rogue River-Siskiyou National Forest. Cost-to-date has reached $1.4 Million. A wildfire broke out on August 11, 2018, located 11 miles northwest of Northport, Washington State that was started by a lightning strike. Due to extremely dry and high temps, the fire would build up to 300 acres scorched. On August 14th, the fire was 19 miles north of Evans, Washington and was reportedly near the US / Canadian border. The fire behavior at that time was said to be very active with uphill runs, torching and backing. On that day, the fire had burned up to 667 acres with a 0% containment status. 229 personnel along with 9 crews, 5 engines and 3 helos staffed the incident. On the same day, an Air Spray USA firefighting plane crashed around 1400 hours but the pilot was able to self-extricate himself and walking away with non-threatening injuries. Today, the fire has now crossed over the US / Canadian border burning the area threatening regional transmission lines, private timber, grazing allotments and 33 nearby homes. Evacuation orders are in effect. Unified Command consist of BC Wildfire Services, Regional District Kootenay Fire Mgmt, USFS and NWIIMT9. At the time of this report, the fire has burned 3,000 acres and is 20% contained. Firefighters have been faced with many active wildfires and brand new fire starts. There are currently 386 personnel along with aircraft, engines and heavy equipment resources assigned to this incident. FOLLOW US! You can also find great updates, job announcements and other fire information on our Social Media pages here —> @nwfireblog (Twitter and Facebook). 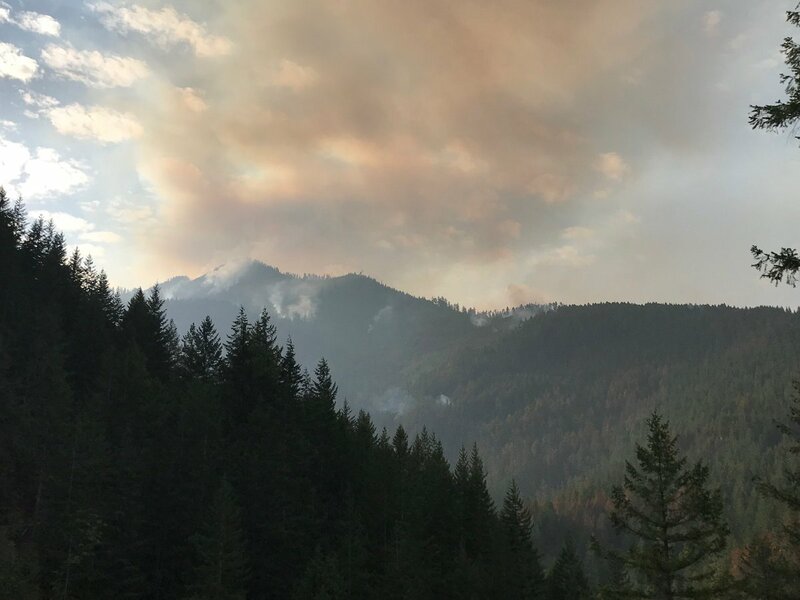 FERRY COUNTY, Wash. | A wildfire is burning in the northwest corner of Ferry County in the Graphite Mountain area and two miles south of the Midway border crossing. The fire started on August 11, 2018 and is located in very steep and heavily timbered ground from a lightning strike. Winds picked up last night increasing fire activity and presenting challenges for fire suppression efforts. Ground crews grew in size and in force this morning with the military responding to the call for action. This includes the Air and Army National Guard. The breakdown of resources include – four-20 person hand crews, three National Guard crews, two tenders, one falling module, two engines and two dozers bringing the total to 204 personnel. Fire has burned 52 acres. There is a 10% containment status. Homes and agricultural structures along with livestock forage and commercial timber are being currently threatened (about 40 structures). There is a Level 1 evacuation notice in effect. Incident Command Post is located at the Curlew School in Curlew, Washington State. The Northeast WA IMT is in fire command. 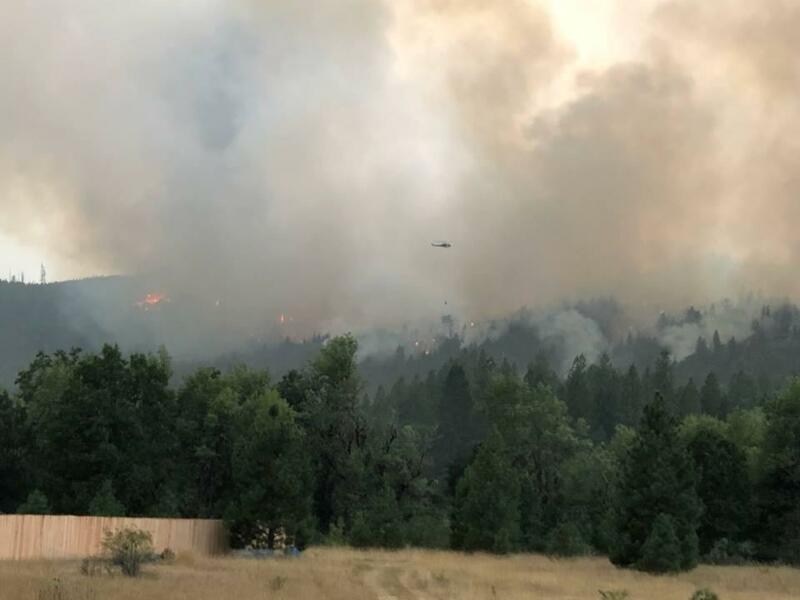 A wildfire began on Saturday, August 11, 2018 is located west of Grand Coulee Dam and Banks Lake near Mansfield in Washington State. The fire is burning near Sims Corner in Douglas County. SE WA IMT Team 2 is in command of fire. Team is handling PIO Social media posts. habitat threatened. Fire mobe resources have arrived and are on the fire line.